Love Indian food but feel it's too daunting to recreate at home? Those complex authentic flavors! Those dozens of spice blends! The long prep time! Fear not. Award-winning cooking teacher Raghavan Iyer puts the breeze and ease into Indian cooking. Taking a heavily illustrated, step-by-step approach, he introduces cooks to one of the world's most popular cuisines. With his natural charm and enthusiasm, Raghavan begins each chapter by explaining the recipe choices, what techniques are included, and a suggested order in which to approach the recipes. The book's 100 authentic recipes use only ingredients readily available at the local supermarket. Taking into account time restraints, each dish can be quickly assembled and will give home cooks the confidence to create knockout Tandoori Chicken, Coconut Squash with Chiles, Turmeric Hash Browns, Saffron-Pistachio Ice Cream Bars, and Mango Bread Pudding with Chai Spices. 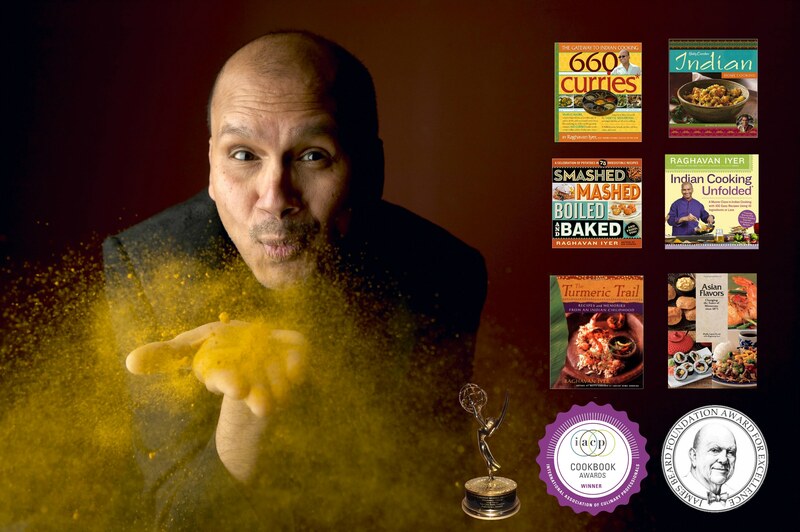 Raghavan Iyer, an Emmy winner, a James Beard Award winner, and IACP Award-winning Teacher of the Year, is the author of 660 Curries, Indian Cooking Unfolded, Betty Crocker's Indian Home Cooking, and The Turmeric Trail. He is also host of the Emmy Award-winning documentary Asian Flavors and a member and President (2014-2015) of The International Association of Culinary Professionals. He was just included amongst the top 100 influencers ever for home cooks by Epicurious.com and was also featured twice in the New York Times in 2016. A native of Bombay who is fluent in six languages, Raghavan is a culinary educator, spokesperson, and consultant to numerous national and international clients including General Mills, Target, Canola, and Bon Appétit Management Company (BAMCO) , where he helped launch an Indian Meals program and trained all BAMCO chefs across the United States in Indian cuisine and Global Vegan Cuisine through over 75 national workshops. Additionally, at Case Western Reserve University Iyer helped design and open an Indian-concept café, Naan in August 2014. Raghavan received a 2016 James Beard Award for his online video series "Indian Curries: The Basics and Beyond" and was a Finalist for a 2005 James Beard Award as a contributing writer for EatingWell magazine, and for a 2003 James Beard Award for his cookbook The Turmeric Trail. He received the coveted 2004 International Association of Culinary Professionals Award of Excellence for Cooking Teacher of the Year, was named a 2008 Sustainable Seafood Ambassador for the prestigious Monterey Bay Aquarium, and was awarded the Doctorate of Foodservice by the North American Association of Food Equipment Manufacturers. He has written for Cured, AllRecipes Magazine, Cooking Light, Fine Cooking, Saveur, Weight Watchers Magazine, EatingWell, Gastronomica, and many others and was recently featured in the New York Times. Raghavan is also co-founder of the Asian Culinary Arts Institutes, an organization dedicated to the preservation, understanding, and enjoyment of the culinary arts of Asia. He has a line of roasted spice blends, Turmeric Trail, and an app, Raghavan's Indian Flavors, available through ITunes and the Android marketplace. He lives with his family in Minneapolis and can be found at RaghavanIyer.com.